It must be puzzling to those around lupus patients how wildly our disease(s) differ. These differences occur from day to day, between different lupus patients patients, etc. It must be so confusing to hear that patient A is being treated for lung complications this week, while last month patient A was in the ER for seizures. Or for that matter, why is it that patient B, who also has lupus, has neither lung nor epileptic symptoms? Why does B instead have failing kidneys and pathologically dry eyes? It must sound a lot like our doctors are a bunch of sadists with knives and poisons. I'll confess to having given that theory serious thought myself, from time to time. Lupus, as I've mentioned before, directly translates to “Wolf.” The origin for the name "lupus"for our disease remains somewhat unclear. 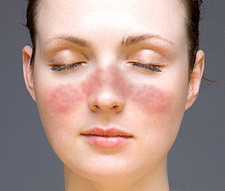 I have heard two explanations: 1) that the traditional lupus rash across the face resembles the markings of a wolf. 2) That the same rash resembles a person whose face has been bitten by a wolf. (That data upon which #2 is based I really don't want to know). Either way, the wolf has given the disease both its name and a symbol. So, we are going to use that; Lupus is a wolf. To someone with lupus, our body is an-all-you-can-eat buffet. And herein lies the individualistic, idiosyncratic, and changing nature of the disease. Every day, a different wolf (one for each patient) goes through the individual's body buffet, and picks out whatever (s)he fancies. So maybe patient A's wolf happens to be craving lungs this month, while patient B's wolf doesn't care for lungs, but absolutely loves kidneys and tear ducts. And wolves, just like people, get tired of particular foods. So after a while, Wolf A will get sick of lungs, and decide to start nibbling on joints (or blood cells, brain tissue, etc.) instead. Meanwhile, patient C's wolf is a growing teenage wolf, and will eat absolutely anything he can find at the body bufet; this patient, then, is likely to be very sick in a number of different ways. 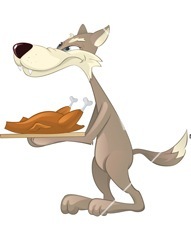 So in the end, a lupus patient's job, and that of his/her doctors, is to either weaken the wolf to the point where it stops going to the buffet, or make the buffet itself less attractive. The immunosuppressants we take aim to do the former. As for the latter, there are a (very) few things we can do to prevent attracting the wolf. For example, my personal wolf really likes sunbaked Sam, so if I can avoid sunlight, I can make myself slightly less attractive to my wolf. Hence my lifestyle that would put a photophobic vampire mole to shame. As gruesome as this may all sound, it's really not that far from the truth. I have anthropomorphized the disease, obviously, but its actions resemble what I have described. No, I don't actually have a wolf chomping on me every day, (although it often feels like it), but I do have a disease that seemingly randomly decides to destroy different parts of my body for no apparent reason. So for me, thinking of it as the Big Bad Wolf helps. It's a slightly humorous way of describing something that isn't humorous at all. Unfortunately, this often leads to bad "wolf-hunting" puns, but you can't win all the time. Stay tuned for next time, when we learn why the *$@! wolf likes to bring his/her friends along to the buffet! a painful joint disease. Thanks for helping us understand a little bit more about what all the lupus patients might have to deal with. If you have time, I've one more question about your gloves, under your Squeee! post. Thanks, I'm always hoping that I help people understand the disease a little better! So many people have this horrid disease, but so little is generally known about it! I'm sorry, I did see the question, but then I had to have an MRI yesterday, and then the audiologists tortured me so badly today that I'm too dizzy to do anything at all right now. But I'll try to get to it tomorrow. If I don't, please remind me, as my current short-term memory resembles that of a chipmunk on crack. Yikes! First the wolf, now the chipmunk, on top of the crazed medical techs. Hope you can rest and the dizziness passes soon. No rush on the measurement. I think my pattern will fit fine, just want to doublecheck. Take care. I remember a test years ago with an audiologist with little bouncing yellow dots on a screen in the dark inducing dizziness and the guy saying something about..chiasma? Not sure I'm remembering the right word.